House T2, àrea 180 m2, two bedrooms, two bathrooms on the village and the beach P. Sol. 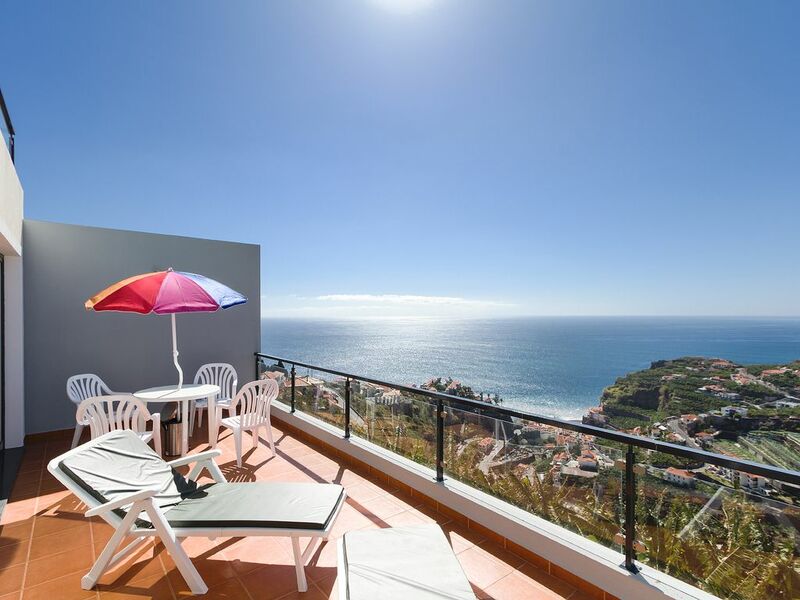 The "Casa Araujo" is an excellent villa, built in 2014, situated on a promontory and over the village and the beach of Ponta do Sol. The view is superb, particularly in the area of ​​outdoor terraces; a terrace in front of the room with about 40 meters and another larger at a higher level. Simply magnificent! The interior, spacious and bright, consists of two bedrooms, two bathrooms, kitchen, dining room, living room and laundry. It presents a practical and youthful style, where the light and the sun, enter through the entire space. We have table and chairs on the terrace, sun loungers and parasols. We spent 18 days in January at this villa. For the wettest month in Madeira we had great weather for hiking with few short showers. We really enjoyed our stay. The house is comfortable and clean with the stunning view from big balcony. Special thanks to Nelson for making us feel so welcome, his kind hospitality and awesome welcome gifts. Thank you Ela and Bob, for the kindness of your comment. It was a pleasure to see you again and to know that you felt good on the island and in this beautiful home. I am sure you will return to the island, for you are in love with it. Receive a hug the size of the world and know that I will always be here when you need it. Amazing little slice of heaven! Our stay at Casa Araujo was lovely. The house is comfortable, cozy and has everything you need. The most amazing thing about it is the million dollar view, breathtaking! Also Nelson was very attentive and even drove us over to the property the rest of our family was staying in! We highly recommend Casa Araujo and the beautiful island of Madeira. Thanks Zinda, Paula and Nick, for coming for the first time to Madeira, and they chose the Casa Araújo, to stay. It was a pleasure to meet you. Your sympathy is captivating. I hope you enjoyed the island and come back soon. I'll be here to welcome you. We stayed at this villa for 2 weeks and it was not long enough!! The villa is very spacious, new and beautifully presented! Right from the start of our stay Joao made us most welcome, meeting us showing us to and around the villa, a very pleasant gentleman who could be contacted in the event of any problems, ( we had none). The villa is equipped with everything you need during the stay, a lovely big fridge/freezer. The views from the balcony are breathtaking! Just to sit there relaxing in the sunshine (which you get all day) was lovely! Thanks Lilian, Dave and Joe. the kindness of your comment. In fact, given the generosity of your words, little remains for me to add. The house and the place, are described in detail for you, so that anyone reading this review, know exactly what to expect. I can only ask you to come back again and invite your friends to visit us too. Will all always welcome and well received. We have spend an excellent week in this very recent house offering all you may need for a family with 2 children (8 and 13). The manager welcomed us warmly and was very responsive and reliable before and during all stay. Upon departure he even brought some local goods as a get away. The view from the terrace is beautiful and it is a great pleasure to enjoy late afternoon sun after a day hiking on one of the many beautiful trails. There is a BP gas station on the round about of Ponta Do Sol where you can find all basic including fruit and vegetable as well as decent bread (meat and ham is not very good, poor chese offering). Larger supermarket (Continent) about 15 minutes drive with large selection of food. But if you are for organic food bring yours as difficult to find on the island. Kitchen equipment in apartment is sufficient for standard cooking and there is a large fridge with a big freezer. The only limitation may be with the car as the access is by a narrow street and we used the parking of the owner house just next to the rental, as the one in the house is almost impossible to use except for very small cars. Check about this with the rental manager to make sure it is available. If we go back to Madeira we will be happy to come back to this rental. It was for me a great pleasure to receive the Roodenbeke family at Casa Araújo and give them welcome at the Madeira Island. They were always very friendly. They form a wonderful family. Children are very well educated, and I loved the little Helene. Thank you for coming, and come back when you can. And invite your friends to visit us. Are always welcome! Very warm wellcome, clean department with very nice scenery from balcony. Good, quiet location, excellent for people who wants to travel around the island. Good and helpful service. We would surely recommend this property to others also. Thank Sami and Kristiina, for your kind words. It was a pleasure to receive you in the Casa Araújo. It is indeed a great home for anyone visiting the island and looking for good location, coupled with the silence and privacy. I hope to return (within 5 years? ), for a more beautiful and pleasant vacation. Thank you very much for coming to Madeira Island! Tolles großes Haus in Top Lage mit gigantische Aussicht! Das Haus ist mit allem ausgestattet was man als Selbstversorger braucht, Küche mit Gasherd und Ofen, großer Kühl- und gefrierschrank, Waschmaschine, Bügeleisen und Brett. 2 Schlafzimmer, 1 großes ensuite Bad mit Wanne, 1 kleines Bad mit Dusche, großes Wohnzimmer mit Panoramafenstern und Meerblick nach Westen und anschließender großer Terrasse. Extra Anbau mit gemauertem Grill. Dachterrasse auf der man auch zum Frühstück in der Sonne sitzen kann. Wir hatten einen Kombi und konnten problemlos am Nachbargrundstück der Besitzer parken. Nelson war immer erreichbar und hilfsbereit. Insgesamt 5 Sterne. Leider funktionierte das Warmwasser nicht richtig, man musste teilweise das Wasser 5 min laufen lassen, deshalb 1 Stern Abzug. Thanks Nils, Monika and Matilda, for the kindness of your comment. In fact it is a privilege for our guests, to enjoy a large house, fresh and with wonderful views, during their vacation. It's good to know that people were happy here. With regard to water heating, I have the promise of the plumber of immediate solution, already this week. For that, I apologize, because it did not always work well for the first time. I hope to have the pleasure of your visit in the near future. I would like to see and follow Matilda's growth.